That’s what a friend suggested to me over the weekend – and it’s usually a credible claim. I too have observed folks cranking up their social media engines in advance of a transition. In this case only part of that statement is true — I have been blogging more lately and intend to continue. Writing for me has always been the path not taken. After years of school paper editorial roles and an internship on Late Night with Conan O’Brien I veered towards technology work instead, believing that code was the prose of the future. And I’ve been incredibly fortunate to work with great teams at Second Life, Google & YouTube to build wonderful platforms powered by people. No regrets. But I do think back and wonder whether I could write for a living – nonfiction or journalism mostly. So I write again now to revive that part of me. And because I have my first child coming in a few weeks so I’m feeling the need to create outlets. And because 2011 was a wonderful but challenging year so I’m processing everything that happened, that I experienced. And because I love the technology community so much that I hope to contribute to it not just by my work but via blogging, tweeting, sharing ideas in every way possible. I write because it’s inside of me and wants to get out. And I write publicly because that’s one of the only things which still scares me. To be exposed. I don’t write exclusively to be noticed but it’s definitely nice to get kudos from people I know and new faces who find me because of something I’ve written. And I get a kick out of guest posting on TechCrunch or GigaOm or whomever wants me. The few minutes which someone spends to read a new post – I take that seriously. I want to give them something of value. Hopefully which causes them to consider an idea in a different way. To build on top of what I put out there because I probably built my layer on top of someone else’s foundation too. So I will continue to write and I’m excited if you continue to read. FYI – here’s my blog traffic since 2009 (not including feeds or pageviews on G+ or Facebook). 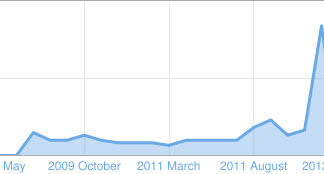 Recent spike is when I started writing more frequently. My posts are now doing ~500 – 8k pageviews on my own blog when I push them to social media.